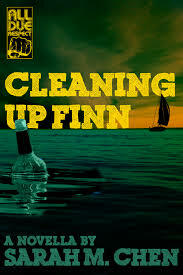 I absolutely loved Cleaning Up Finn by Sarah M. Chen. I defy anyone who reads this tightly wound novella to find anything wrong with it. It has a classic noir main character, death, despair, and—best of all—a full-throttle plot that picks up more and more speed as the plot unfolds. Phineas Roose (Finn) is a single man who, although he comes from a well to do family, makes his living managing a local restaurant. Although he is quick to point out it is one of the top grossing restaurants within the organization’s chain, he knows he hasn’t lived up to his father’s expectations. He spends his time at work trying to pick up well-to-d0 women and one night he succeeds when he picks up Ronnie, a kindred soul who shares with him the bond of not living up to their parent’s expectations. He takes Ronnie onto the boat of his uber-rich best friend (well actually his only friend) and they commence to have a party for two. When his overindulgence of wine leaves him unable to consummate their new relationship, he ends up leaving Ronnie face-down drunk near the boat dock. The next morning Ronnie has disappeared and the police, and ultimately a private eye hired by Ronnie’s parents, become involved and they all set their sights on Finn. As Finn tries his best to clear his name in Ronnie’s disappearance, he quickly learns that Ronnie is not the person who Finn, or anyone else, thought she was. As the pressure starts to get to him, Finn is willing to do anything to extract himself from the noose tightening around his neck. Readers will be shocked to learn just how far he’s willing to go and who he’s willing to hurt to keep himself from going down. As things get worse for him, Finn becomes more desperate and his downward spiral brings him closer to his breaking point. Chen has written some solid stories that were published in the All Due Respect anthologies, but this is the first longer piece I’ve read from her. She follows a classic noir formula in this offering, but she puts in her own little touches and keeps the story feeling fresh. This novella is a solid piece of writing and I am looking forward to her next foray into longer pieces of noir fiction.